Scientists say that yellow is the easiest color to see. In studies of color blind people, if they see any color, it will be yellow. 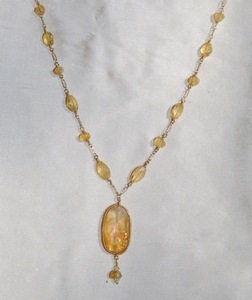 This amazing necklace of all citrine and gold-fill with Swarovski crystals at the clasp and in the pendant is a warm and wonderful way to be seen. I picked this central citrine pendant and wire-wrapped a bezel around it to really make a visual impact.